A Sweet, Clean, Inspirational Romance Novel of Dreams, Love, Sisterhood, Friendship, and Forgiveness. When wedding photographer, Joel Canfield, spots stunning bridesmaid, Heather Garity, he falls head over heels. Except Joel doesn’t believe in love at first sight. Besides, physical chemistry or not, Heather already has a boyfriend. At least she does until she catches said boyfriend making out with her little sister. Heather swears off men. Finishing college and opening her own florist shop are more important goals - dreams she's worked towards for years. Heather’s best friend, Amelia the set-up queen, notices the spark between Joel and Heather. With Joel’s help, Amelia manipulates a beach getaway for Heather and Joel. But when Heather – who hates being set up – discovers that’s exactly what happened, the coastal vacation backfires and sets off a series of unfortunate events. Will Heather pull the plug on Joel, her sister, and her best friend? Or can she find it in her heart to forgive them? And if she can swallow her pride and forgive those who hurt her, will she have to put her dreams on hold for a chance at true love? This is the first full-length Bellham Romance, a series connected through the small town, close-knit western ranching community of Bellham, Oregon, and through the quirky and loving characters that call Bellham home. 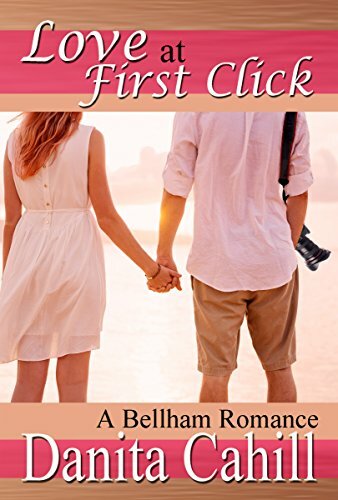 Like the other Bellham Romances, Love at First Click can also be read as a stand-alone book. What readers are saying - "This is a well-written novel that will have you turning the pages to find out what will come next. The plot is believable and the characters are loveable. Love at First Click is a sweet romance you will want to read over and over." "Cahill's humor and wit eases the pain of a bad break up and a surprise blind date. Believable characters and fun setting make this book a keeper."